If somehow we can translate what a hibernating bear does to human beings, that would be amazing in terms of healthcare cost savings AND patient well-being. Imagine being put into a hibernating state while doctors cure your cancer or you recover from surgery or a major illness. Imagine paramedics inducing a hibernating state in a major trauma victim of a motor vehicle accident. Once your illness, surgery, cancer, or whatever has been cured, you "wake" from your hibernation fully functional without any deterioration in muscle/bone mass or strength. You would literally be able to wake up and go home as if you just woke from a nice long sleep. From a hospital standpoint, the cost-savings would be enormous. No need for feeding such hibernating patients. The entire field of physical therapy and orthopedics would be dramatically reduced given bones would be stronger with less risk of fractures. 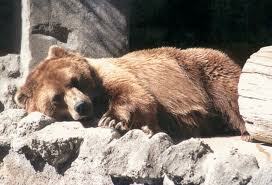 Hibernation would be a natural sleep as opposed to anesthesia which is more akin to a coma. In terms of ENT, adults can theoretically elect to go into a hibernating state after a tonsillectomy so they would not have to experience the horrible pain that lasts for 2-3 weeks. Read more about the amazing hibernating bear on NPR news here.